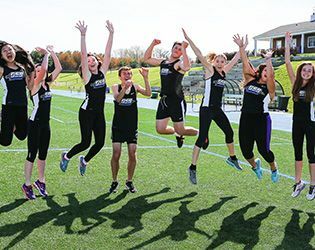 On Saturday at the Millburn Relays, varsity track and field earned four medals in relay events and set new school records for three of those events. Winning the first event of the day and setting a new school record of 18:54 was the boys' 4xMile relay team of Michael Iannaconi '16, Felix Andersen '17, Mathieu Petit '17 and Bobby D'Angelo '18. Following that, Greg Niccolai '16 and C.J. Licata '18 garnered first in the discus relay and set a new school record with a combined distance of 247'0". The third record of the day came in the girls' Frosh/Soph sprint medley relay. The all-freshman squad of Alicia Amoroso, Chloe Doherty, Lily Fischer and Alyssa Jurewicz placed fourth and set a new school record of 4:47. The girls' distance medley relay team of seniors Sahara Ensley, Jackie Roettger and Lillie Wilson and freshman Fischer earned medals by placing sixth, with a time of 13:53. The boys' shot put relay of Niccolai and Licata placed seventh with a combined distance of 80'.5, missing a medal by only 0.5 inch.